Langtang Tamang Heritage trekking is newly open trekking trail in Langtang region. Langtang Tamag Heritage trail offers superb Himalayan views , Tamnga ethnic groups culture and tradition. Langtang Tamang people are known as ethnic group of Nepal that inhabits the region north of Kathmandu Tamang Heritage trekking trail has been opened up, allowing you to explore the fascinating culture of the Tamang people. Previously a restricted area near the Tibetan border, the unexplored regions of Langtang National Park have been developed into the Tamang Heritage Trail. The Tamang Heritage trail is a new tourism product that promotes sustainable and responsible tourism. Tamang communities are generally found on higher elevations with the peasants engaging in shifting cultivation and extraction of forest products. They are mainly sheep and yak herders but grow some grains and vegetables. 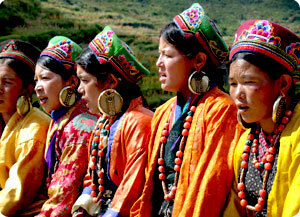 Their daily life activities include raising livestock, agriculture and trade with Kerung in Tibet. They also make baskets and mats from mountain bamboo. The trail starts from Syabrubeshi and passes through Goljung, Gatlang, Thuman, Timure, Briddim, Lama Hotel, Langtang valley and Kyangjin Gompa and culminates in Syabru besi. For the Langtang Tamang heritage trekking start with an overland journey to Dunche, the main trading post of the area. From here we spend five days hiking up through this beautiful alpine valley to Kyangjin where we rest for a day for some exploration of the high mountains and glacial systems. We track back for three days before taking a different route back to Dunche and onwards to Kathmandu. Himalaya journey Treks and Expedition arrange langtang Tamang heritage trekking according to travelers /trekkers holiday schedule. Splendid breathtaking place: production Method of cheese and relaxing with different culture. Day 01: Arrival in kathmandu 1334m, Himalaya Journey Treks & Expedition’s representative will transfer to hotel , Langtang tamang heritage trekking briefing with officially arrangements. overnight at Kathmandu. Day 03: Syabrubeshi trek to Gatlang (4 hours) ,overnight at Gatlang. Day 04: Gatlang trek to Tatopani (hot spring) (5 – 6 hours) overnight at Tatopani. Day 07: Briddim trek to Lama hotel (5 – 6 hours hours) overnight at Lama hotel. Day 08: Lama hotel trek to Langtang village (4 – 5 hours) overnight at Langtang village. Day 09: Langtang trek to Kangjin Gompa (3 – 4 hours) overnight at Kyanjin Gompa. Day 10: Kangjin acclimataization / Excursion day.During this day trekking guide will take to you Tseko Ri 4984m for superb Himalayan scenerary including the Langtang Lirung, Yala peak, Naya khanga, Langshisa, Dorje Lakpa etc , back to Kyanjin Gompa,overnight at Kyanjin Gompa. Day 11: Kyanjin Gompa trek to Lama hotel (5-6 hours) overnight at Lama Hotel. Day 12: Lama hotel trek to Syabru Gaun/Thulo syabru (4-5 hours) Overnight at Syabru Gaun/Thulo syabru. Day 13: Syabru Gaun/Thulo syabru trek to Dhunche (4-5hours).overnight at Dhunche. Day 16: After breakfast, Relaxing/shopping with own activities ,Himalaya Journey Treks & Expedition’s representative will drop to Kathmandu international airport for onward destination. Day 13: Syabru Gaun/Thulo syabru trek to Chandanbari./Singh Gompa (4-5hours). Chandanbari/Singhgompa. Day 15: Gosainkund lake via Gosainkund pass (4610m) trek to Ghopte. (6-7hours).overnight at Ghopte. Day 18: Chisapani trek to sundari jal (4-5hours) than by private vehicle car/Hiace/Bus back to kathmandu.overnight at kathmandu. Day 19: After breakfast, our tour guide will take to for historical monuments sightseing in kathmandu valley such as Bhaktapur, Pasupatinath, Boudhhanath, Kathmandu durbar square and Monkey temple(swyambhunath) and in the evening farewell dinner in Restaurant, overnight at kathmandu in Hotel. Day 20: After breakfast, Relaxing/shopping with own activities ,Himalaya Journey Treks & Expedition’s representative will drop to Kathmandu international airport for onward destination. Day 18: Tarke Gyang trek to Sermathang (4-5hours)overnight at Sermathang. Day 19: Sermathang trek to Melamchi pul bazaar. (4-5hours).Melamchipul bazaar. Day 20: After breakfast, by bus drive back to kathmandu. overnight at kathmandu. Day 21: After breakfast, our tour guide will take to for historical monuments sightseing in kathmandu valley such as Bhaktapur, Pasupatinath, Boudhhanath, Kathmandu durbar square and Monkey temple(swyambhunath) and in the evening farewell dinner in Restaurant, overnight at kathmandu in Hotel. Day 22: After breakfast, Relaxing/shopping with own activities ,Himalaya Journey Treks & Expedition’s representative will drop to Kathmandu international airport for onward destination.